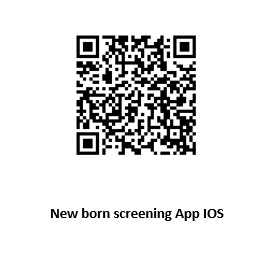 Metabolic Support UK have released a brand new app, designed to provide accessible information to parents whose baby is suspected to have one of the six Inherited Metabolic Disorders on the UK Newborn Screening programme. 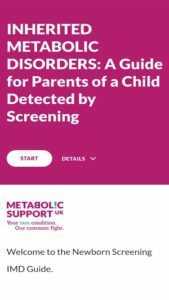 Inherited Metabolic Disorders: A guide for parents of a child detected by screening has been developed for Metabolic Support UK by students and staff at Coventry University led by Professor Jim Bonham. The app is an interactive resource, providing consistent information for new parents on the six Inherited Metabolic Disorders tested via the heel prick test. Designed to reduce anxiety, care has been taken to help families to navigate through the app, taking them through what to expect following a positive diagnosis and where to turn for information, help and support. Family stories, visual infographics and a glossary are used to clearly explain each of the disorders Advice and information from IMD specialists and professionals provide reassurance throughout, at what can be a very confusing and difficult time. We hope that the app will be a useful tool for Midwives and Metabolic Specialists to share with families at the point that they receive the suspected positive diagnosis. 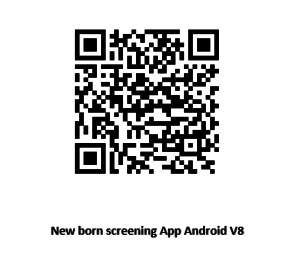 To download the app, click here for Apple (App Store) or here for Android (Google Play) Or download the app via the QR codes below.